Jakarta Governor, Anies Baswedan, appreciates the role of teachers of Early Childhood Education (PAUD). The reason, they have devoted themselves with passion and sincerity.
" Parents and PAUD teachers, they are educators who we know to do with heart"
According to him, besides the parents, the PAUD teachers have extraordinary spirit. They are present in the classroom to educate children from the earliest. 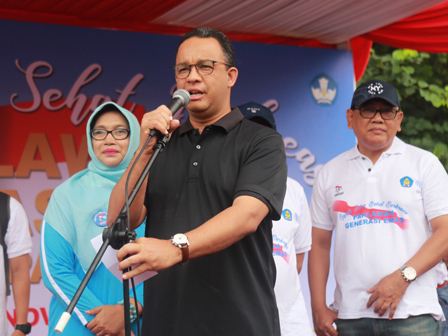 "Parents and PAUD teachers, they are educators who we know to do with heart," he said, when he attended the Healthy Walking Fun along with PAUD teachers in Jakarta, Patung Kuda area, Monas, Central Jakarta, Sunday (11/19). He promised will increase the allocation of APBD to improve the quality of PAUD in Jakarta. Not only for teachers, but it is also for improvement and development of early childhood in all areas. "Hope change is in children, and it starts from PAUD," he explained. He added it is currently being fought for equality for PAUD teachers with other teachers. Hopefully, it could be realized through the legal protection in form of the Act. In the meantime, PAUD's Indonesian Youth Education Association (Himpaudi) Head, Netti Herawati requested, the government to revise the Act to accommodate the equal rights of PAUD teachers as teachers. "I want PAUD teachers to work with a sincere heart. Hopefully all the authorities can pay more attention to PAUD teachers," he finished.